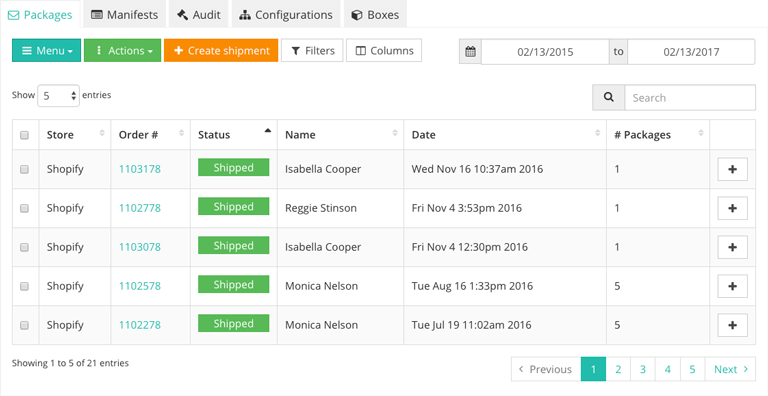 The Packages tab allows you to view and manage shipped packages within a given time range. From here, you can calculate rates for a package, create new shipments, or manage your previous shipments. Rates calculator: This tool will quickly compare rates between all of your connected shipping carriers and the methods appropriate for the given shipment details. Print labels: This will quickly reprint the labels for existing shipments of the selected orders. Print combined documents: This allows you to quickly print a packing slip and a shipping label for for each of the selected orders from the same printer. This is handy if you use a label printer for the packing slip as you do the shipping label, as it saves you the extra steps involved in printing each document separately. Print commercial invoices: This allows you to quickly print a commercial invoice document, which has fields for each item's weight, tariff, origin, and more. This is especially useful in certain international shipping situations since it provides important information for customs and for freight forwarders. Void labels: This will quickly void the labels for existing shipments of the selected orders. Create shipment: This allows you to quickly create a new shipment with an order number, shipping address, and return address. Filters: You can filter what is shown in the packages table by sales channel. Search: This allows you to search for packages by their order number, customer name, and more. Your shipped packages are laid out in a table. You can expand a shipment to view more information about it, such as the order details, by toggling the Expand button. Store: The name of the sales channel through which the shipment's order was placed. Order #: The unique order number given to each shipment's order by their respective sales channel. Name: The name of the customer that the package was shipped to. Date: The date and time that the package was shipped. # Packages: The total number of packages that make up the shipment. Postage: The total amount of postage paid for the shipment. Method: The shipping method that was used to ship out the package. Tracking #: The tracking information provided by the carrier for the shipment. Transit status: The current shipment delivery status according to the carrier's provided tracking information. Shipper: The name of the SKULabs user that last created a shipment for the order. Return label: The total number of return labels (if any) that have been created for the order.